Inspired by the fabric swatches on the PurlBee, among others, I started putting this decorating project together months ago. This weekend I decided to finally wrap it up. 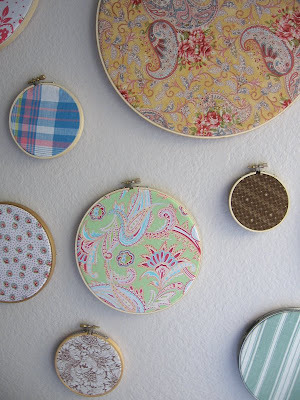 I already had a few vintage embroidery hoops but thought I needed more. I went to JoAnns but they only had brightly colored plastic ones. So, I headed over to Michaels and picked up a variety of wooded hoops. They were all priced for one dollar plus some change. They were cheaper than I had expected meaning I bought more than planned. 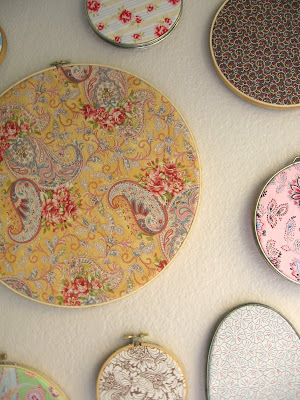 However, I probably wouldn't use them for actual embroidery because I would be a concerned that the hoop would break with frequent use. To put these together, I just hooped the fabric and cut it close to the edge. 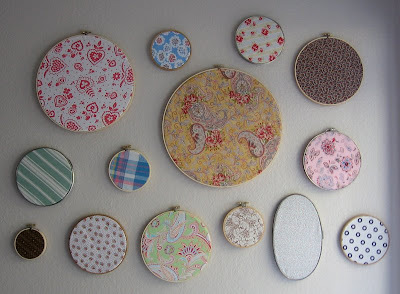 Then hung the hoops on thumbtacks. I may need to do some more rearranging or add some more hoops to get the balance of the composition just right.